The fusion is lit. As bloggingla waxes on the Number One Greatest Fictional Angeleno, we note the unintentional timing of the very clever homage to LA pop culture LA. Meanwhile, we're stepping out for Historic Little Tokyo's big weeked where joy meets soy at the 66th Nisei Week Japanese Festival, (created to preserve traditions), and the Tofu Festival, (where new ideas in using the popular protein source are presented). We wish the above lowrider rickshaw was available to take us around town. The concept is created by artist Clement Hanami and is part of an exhibit at Tigers and Jaguars at the Craft and Folk Art Exhibit showing how local artists are fusing cultural influences. The Rafu Shimpo describes the show as "the meshing of ethnicity in development of visual and sonic hybrids by intermingling symbols and iconography from both Asian and Latino cultures." Hanami is Japanese American, raised in East LA, and now is Art Director for Exhibits at the Japanese American Museum. From the Los Angeles Times "Visual Blend of Two Cultures"
Hanami's work emphasizes this cross-cultural exchange within a social context. His investigations on identity have been informed by his experience growing up in the Eastside. His "Rice Rocket" on display is a working rickshaw tricked out with lowrider-style wire-spoked rims and white-walled tires. Speakers are attached below the seat and play the tunes of War and the Stylistics. "As an artist, I look at what it is about this experience that is unique and how it impacts being Japanese American or being a minority within a minority," Hanami says. "So you have a rickshaw, something I'm not even familiar with. Lowriders are more familiar to me — even my Japanese American friends had them, because it's part of L.A."
This culture adapation is also part of Nisei Week. Ever since the early 60's, Japanese car clubs used the weekend to cruise Alameda and 4th street in low rider cars influenced by East LA's car clubs. Decades later, the more recent cruising has been in modified imports with loud engines and rave music. Only a few years ago, this subculture was officially added to the Nisei week celebration. That's a multitasking of Little Tokyo influence. Japanese traditions, tofu as a cult following, the rave sub culture of car clubs and one of the most prized buildings in the neighborhood is one that held a Chinese cafe just had a grand opening –– all while the number one pop culture icon noted by a LA based blog is a made-for-movie Japanese mentor in the Valley; plus an exhibit a few miles away on Wilshire that documents the start of art movement in Asian and Latino cultural fusion. Well, that in this View From a Loft, is what really defines LA. Traditions honored while new cultures are created. I think Hanami's work really symbolizes what is most interesting, exciting, and well, fun, about East LA culture. This type of fusion is an LA tradition: if you've ever taken a walk through neighboring Boyle Heights, you know that the visual blending of past and present, and of diverse cultures, is virtually endless and pushes the limits of imagination. Maybe rickshaws should be introduced into downtown: it would be a great way to avoid all the traffic jams, and someone would get some exercise. I agree. East LA's history is so deeply rooted in several ethnic cultures creating a movement that could be called Asian Latino Fusion. Or LatinAsianFusion, aka LAFusion. 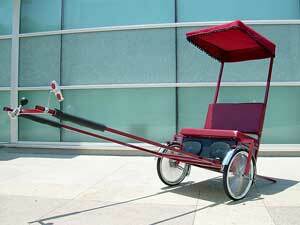 And rickshaws with multicultural markings could be used at events to link Little Tokyo, Chinatown and El Pueblo. While urban art needs to be cynical to be noticed, or defined as social commentary to Be considered compelling; it's artists like Hanami who have a skill in interpeting personal experience with a wit that leaves no bite marks. And we need that once in a while. Hanami's work transforms something that is so stereotypically reminiscent of old ethnic enclaves by adding something that is unique to LA urban culture--how we modify our cars to make a statement about ourselves and be different. Like was said before, it is exactly his melding of past & present and his allusions to a communal history that makes his work funny and familiar.